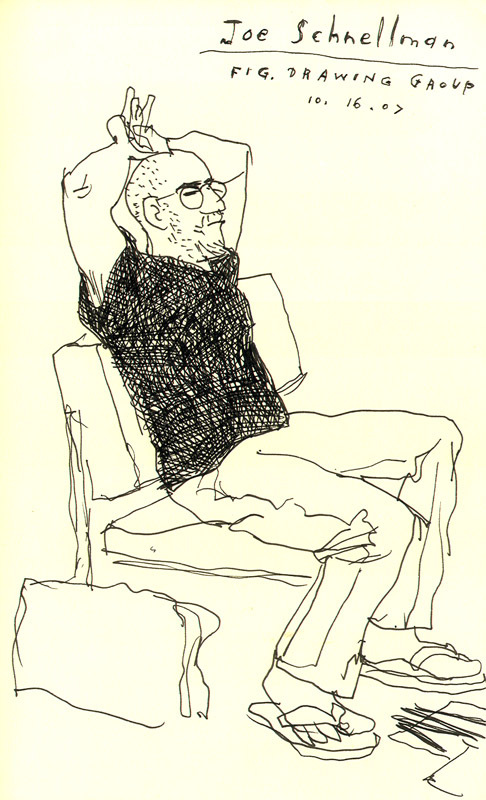 Well, one thing changed at figure drawing group while I was gone--Joe Schnellman started showing up. Last time I saw him he was all pimped up in a shiny suit and an ad-guy smile, and I was glad to see he'd fallen off that wagon, if only temporarily. I assume he's filling the slot vacated by Artmark, who's probably lying in a pool of his own vomit in the storeroom of a girly club out on George Washington Highway. Boy, there's a sad story to be told one day by a Bukowski type. You could see it coming months ago, the erratic staggering and pitching of easels, the spilling of gouts of ink on the floor, the "accidental" smashing of sculpture, the incoherent beer-driven monologues, fevered, drooling and profane. Those were the days, all right. And now we have Schnellman, and the closing down of the studio. The next session is scheduled to take place at Bernard's kiosk in Waterside, but I have my doubts about that venue.